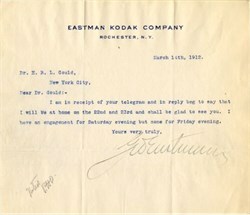 Letter on Eastman Kodak Company letterhead handsigned by the company's founder George Eastman issued in 1912. This item has the signature of the Company's Founder George Eastman and is over 102 years old. The letter arranges a meeting with his long time friend E.R.L. GOULD. It was GOULD and EASTMAN who persuaded JACOB RIIS to produce his important social work HOW THE OTHER HALF LIVED. Gould provided the money and Eastman provided the camera and film to produce this first book of photo journalism. George Eastman (July 12, 1854 � March 14, 1932) founded the Eastman Kodak Company and invented the roll of film, helping to bring photography to the mainstream. The roll film was also the basis for the invention of the motion picture film in 1888 by world's first filmmaker, Louis Le Prince, and a decade later by his followers L�on Bouly, Thomas Edison, the Lumi�re Brothers and Georges M�li�s. Eastman was born in Waterville, Oneida County, New York. He was the fourth and youngest child of George Washington Eastman and Maria Kilbourn, both from the bordering town of Marshall. His third sister died shortly after her birth. In 1854, his father established the Eastman Commercial College in Rochester. The Eastman family moved to Rochester in 1865. Two years later after his father's death, George Eastman left high school to support his mother and sisters. At age 14 he began working as an office boy. In 1874, Eastman became intrigued with photography but found the process awkward. It required coating a glass plate with a liquid emulsion, that had to be quickly used before it dried. After three years of experimentation with British gelatin emulsions, Eastman developed a dry photographic plate and patented it in both England and the US. In 1880 he began a photographic business. In 1884, Eastman patented a photographic medium that replaced fragile glass plates with a photo-emulsion coated on paper rolls. The invention of roll film greatly sped up the process of recording multiple images. Ad for the Kodak camera.Eastman then received a patent in 1888 for a camera designed to use roll film. He coined the marketing phrase, "You press the button, we do the rest." The phrase entered the public consciousness. It was even incorporated into a Gilbert & Sullivan operetta (Utopia, Limited). The camera owner could send in the camera with a processing fee of $10. The company would develop the film, print 100 pictures, and also send along a new roll of 100-exposures film. On September 4, 1888 Eastman registered the trademark Kodak. The letter "K" had been a favorite of Eastman's. He said, "It seems a strong, incisive sort of letter". Eastman and his mother devised the name Kodak with an anagram set. He used three principal concepts to create the name: it must be short, it could not be mispronounced, and it could not resemble anything else or be associated with anything but Kodak. By 1896, 100 Kodak cameras had been sold. The first Kodak cost USD $15. In an effort to bring photography to the masses, Eastman introduced the Brownie in 1900 at a price of just $1. It became a great success. In 1925, Eastman gave up his daily management of Kodak, to become chairman of the board. He thereafter concentrated on philanthropic activities, to which he had already donated substantial sums. He was one of the major philanthropists of his time, ranking only slightly behind Andrew Carnegie, John D. Rockefeller, and a few others, but did not seek publicity for his activities. He concentrated on institution-building and causes which could help people's health. He donated to the University of Rochester, establishing the Eastman School of Music and School of Dentistry; to Tuskegee Institute; and to the Massachusetts Institute of Technology (MIT), donations which provided capital to build several of their first buildings at their second campus along the Charles River. In his final two years, Eastman was in intense pain, caused by a degenerative disorder affecting his spine. He had trouble standing and his walking became a slow shuffle. Today it might be diagnosed as spinal stenosis, a narrowing of the spinal canal caused by calcification in the vertebrae. Eastman grew depressed, as he had seen his mother spend the last two years of her life in a wheelchair from the same condition. On March 14, 1932, Eastman committed suicide. He left a suicide note that read, "To my Friends, My work is done. Why wait?" His funeral was held at St. Paul's Episcopal Church in Rochester. Eastman, who never married, was buried on the grounds of the company he founded at Kodak Park in Rochester, New York. A First Day Cover Honoring George Eastman 1954.Eastman had a very astute business sense. He focused his company on making film when competition heated up in the camera industry. By providing quality and affordable film to every camera manufacturer, Kodak managed to turn its competitors into de facto business partners. ELGIN RALSTON LOVELL GOULD (1860-1915) was a respected economist who taught at various universities and contributed studies on labor statistics and social trends for the U.S. government. He was also a businessman who developed a limited dividend corporation for moderately priced housing.